Pregnancy can make you more prone to Sciatica due to a number of changes that occur in the pelvic area whilst pregnant. For example, increased relaxin hormones during pregnancy can cause the ligaments and structures which attach your bones and joints together to relax and stretch more than normal. These changes can increase your risk of conditions such as Piriformis Syndrome which can trap the sciatic nerve and lead to Sciatica. Your babies weight and position in the womb can also cause compression of the sciatic nerve and trigger Sciatica. What is Sciatica and what are its symptoms? Sciatica (also referred to as lumbosacral radicular syndrome) is caused by the compression of the sciatic nerve located in your lower spine and thigh. Sciatica can often cause occasional or persistent dull aches and sharp shooting pains in your lower limbs you may also have problems standing, walking or sitting. Pain can often range from mild to sever and tend to originate from your lower back and hips and will shoot through to your thighs. Compression of the sciatic nerve can be brought on by a number of lumbar spine problems including bulging or a slipped disc. Sciatica can also be triggered by number of underlining conditions as well including stenosis, osteoarthritis, degenerative disc disease, or spondylolisthesis. How can this Support help with Sciatica? If you are suffering from Sciatica during pregnancy it advised to do regular exercises and massages in order to help stretch and strengthen the supporting muscles around your legs, buttocks, and hip which will help reduce the pressure on the sciatic nerve. 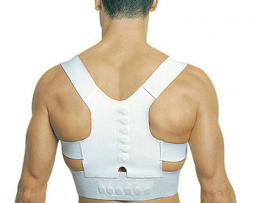 If you are still suffering from Sciatica it is recommended to wear a post partum support to help fix lumbar spine problems that maybe causing pressure on the sciatic nerve. Wearing a support can often help treat Sciatica by helping to correct your posture and realign the spinal column helping to stop the compression of the sciatic nerve. Ever since I gave birth 6 months I go I have had constant pain in my lower back I tried all sorts of exercises and stretches to stop the pain but nothing I tried seemed to do the trick. I eventually found out about this belt after reading a few reviews online about it. I was bit sceptical at first but I had nothing to lose and just wanted to get rid of my back pain so I decided to buy one. I really wish I had bought this belt sooner. Just wearing the belt every day for 2 weeks has done wonders for my back, my psoture is just so much better and I don’t get any back pain at all now. I’m gobsmacked that it actually worked and was this simple! Thank you so much! Would definitely recommend to any one who has just had a baby! Pregnancy totally wrecked my back and posture and ever since giving birth I have been suffering from terrible lower back pain. Tried just about everything to ease it but nothing seemed to work. My friend suggested I buy one of these to help so I did and has helped a lot. Although my back isn’t 100% still but this belt has really helped ease my posture and my posture has really improved! During pregnant I suffered from the most horrendous back pain ever. After I gave birth my back still hurt a lot! So, I decided to buy this belt to try to ease my back pain, after a 3 weeks of wearing the belt my back feels a lot better! During pregnancy I suffered from terrible lower back pain, I thought that it would clear up after giving birth but it didn’t. After a couple months of suffering, I decided to try to do something about it. So, I decided to buy this support and to start doing some yoga and back exercises, this combo has really has helped so much with easing my lower back pain and now my back feels great, I do sometimes get a few niggling pains here and there but my back is nowhere near as bad as it was before.